December 8, 2014 (Monroe Township, NJ) – Mario Tommolillo, owner of Mario’s Classic Auto Body, Paterson, summed up why the New Jersey Small Business Development Centers network needs legislative support. “I’m an Italian immigrant with a high school diploma. I am living the American dream,” he said crediting the NJSBDC network for his success and urging legislators to advocate for the network. 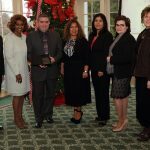 He made his remarks during the festive Annual Small Business Growth Success Awards Luncheon Dec. 5 at the Forsgate Country Club, here, during which 13 business recipients were honored for their commitment, passion and success working with the NJSBDC network. And the state legislators in attendance couldn’t have agreed more. Sen. Linda R. Greenstein (parts of Middlesex and Mercer counties), assured the several hundred in attendance that NJSBDC “is the organization that represents you, small business.” She added that the entire Senate Budget Committee knows how important the SBDC is to the state’s economy. The network, just last year, had 644 clients start a new business and assisted in small businesses being able to create 2,191 jobs and retain 14,288 positions. 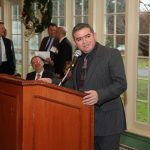 Other legislators who received “Business Advocate” Awards included Assemblyman Anthony Bucco (parts of Morris, Somerset counties) and Assemblyman Ronald S. Dancer (parts of Burlington, Monmouth, and Ocean counties). They expressed equal support of the NJSBDC network’s mission in prepared statements. Assemblyman Ron Dancer was not present due to a schedule conflict, but, Assemblyman Samuel Fiocchi (Cape May County, parts of Atlantic and Cumberland counties) traveled all the way from Vineland, NJ to accept an award on behalf of Assemblyman Anthony Bucco, who was out of town for a legislative conference. As a small business owner himself, Fiocchi who serves on the Assembly Telecommunications and Utilities Committee and Regulatory and Oversight Committee voiced his support for the NJSBDC program, saying it provided needed assistance for small businesses. Several speakers said the passion of Deborah Smarth, NJSBDC COO/Associate State Director in making arguments advancing the cause of small business resulted in real gains. They thanked the CEO/State Director Brenda Hopper and Smarth for their collaborative efforts to publicize and grow the program for the good of small business owners and entrepreneurs. Quoting Thomas Jefferson, Smarth told the crowd, “Do you want to know who you are? Don’t Ask. Act! Action will delineate and define you.” Then, she said each of the awardees acted and defined themselves, calling on the audience to applaud them for their great accomplishments. Hopper acknowledged the support of the Small Business Administration and said the NJSBDC could not do what it does without their support. Al Titone, director of the SBA New Jersey District Office and Kellie LeDet, regional administrator of SBA’s Region II (NY, NJ, Puerto Rico, Virgin Islands), participated in the program. “They are our funding partner,” she said, noting the organization is critical to the NJSBDC. She also acknowledged Rutgers University and Rutgers Business School for hosting their headquarters as well as thanking PNC Bank and PSE&G as financial sponsors of the event. As each of the 13 recipients was lauded, they spoke of the guidance, counseling, knowledge and expertise of the NJSBDC. Tap Factory, LLC (Taseen Peterson, Mark Petersen, Cameron Smith) – A client of the SBDC network E-Business Program. A boutique app developer, the company has developed an application named Notefu.ly which has been downloaded more than 4 million times and ranked as high as the top three in the entire Apple App Store; located in Newark. Optimal Solutions, Inc. (Vijay Hanagandi, Ph.D., CEO) – A client of the SBDC network Technology Commercialization Program. Delivers customized software applications that model, optimize and simulate industrial processes including manufacturing, supply chains, research and development projects to help companies optimize efficiencies and increase profitability; located in Lyndhurst. Glazer Promos, LLC (Trish Glazer, President/Owner) – A client of SBDC at Bergen Community College. A full service promotional products source where creativity, personal attention and value come together. The mission is to translate the needs of the company’s clients into products that give them voice to their message in a customized approach; located in Mahwah. Shore Cake Supply, LLC (Jennifer K. Welter) – A client of the SBDC at Brookdale Community College. Sells cooking tools and ingredients in addition to cake, cupcake, cookie and an array of candy making and decorating supplies; located in Ocean. Advanced Built Structures, Inc. (Deidre McCarthy) – A client of the SBDC at New Jersey City University. Employs between 45 and 75 workers (depending on contracts) and has positioned itself as a leading manufacturer of pre-fabricated steel walls and joists in the Northeast; located in Jersey City. Technical Integration Services, LLC (Shawn and Brian McDonough) – A client of SBDC of Northwest Jersey. Has expanded its client base to include small businesses providing them with the same high-quality, cost effective data center solutions and services that it has provided to medium and large size companies; located in Fairfield. Healthy Balance (Jane Bowers) – A client of SBDC at Raritan Valley Community College. Specializes in gluten-free foods, herbs, and a vast inventory of supplements that support a “healthy balance;” located in Lebanon. Pilani’s Woman’s Boutique Stores (Bharat and Pallavi Aggarwal) – A client of SBDC at Richard Stockton College. A woman’s boutique offering imported designs, unique clothing, handmade accessories, gifts and more, striving to produce the perfect mix of clothing, accessories and gifts; located in Atlantic City. Shade Environmental, LLC (Diana and William Lynch) – A client of the SBDC at Rutgers-Camden. A highly regarded firm by their peers, they specialize in asbestos and mold remediation and mechanical insulation services and employ from 20 to 25 employees; located in Maple Shade. The Mavins Group, LLC (Susan Devaney, CEO) – A client of the SBDC at Rutgers- Newark. A move management company that focuses on serving seniors and provides concierge-style services, frequently related to lifestyle transitions that employs 17, full and part-time; located in Westfield. A. Harrington Limousine Service, Inc. (Jonathan Wilner, President/CEO) – A client of SBDC at Rutgers-New Brunswick. Owned for three generations, the Limousine Serviceoffers luxury service and innovative ideas to maintain and exceed client satisfaction; located in Edison. AJ Cleanness Corporation (Alvaro Lopez) – A client of SBDC at the College of New Jersey. Provides cleaning services for gymnasiums, pharmaceutical companies, general office buildings, restaurants, hotels, events, car dealerships. Government facilities and more; located in Princeton. Mario’s Classic Auto Body (Mario Tommolillo) – A client of SBDC at The College of New Jersey. A successful auto body repair company in business for more than 20 years that stresses being eco-friendly; located in Paterson. The NJSBDC network consists of 12 centers statewide; the organization counseled more than 5,000 small business owners and entrepreneurs, sponsored almost a thousand training sessions statewide and helped its clients create and retain more than 16,000 jobs in the state during calendar year 2013. The New Jersey Small Business Development Centers network provides comprehensive services and programs for small business in New Jersey, helping businesses expand their operations, manage their growth, or start new ventures. Expert staff and practicing business consultants help small business owners and entrepreneurs to develop business plans, find financing, identify new markets, find procurement and international trade opportunities, commercialize technology and develop an E-commerce presence. This non-profit network, a federal-state-educational partnership, leverages funding from the Small Business Administration (SBA), the N.J. Business Action Center, the educational institutions that host the 12 centers as well as other private sponsorships and additional grants. The NJSBDC Headquarters, located at the Rutgers Business School in Newark, NJ, oversees the network which is an accredited member of America’s SBDC. More than 1,000 centers and satellite offices serve small businesses across the country. Visit www.njsbdc.com.